The new “Il nostro latte” (Our milk) logo, created and registered by the Grana Padano Protection Consortium, is an important new element, to fulfil the consumer’s demand for traceability, and so further guarantee the quality, uniqueness and origins of the milk from a protected territory. 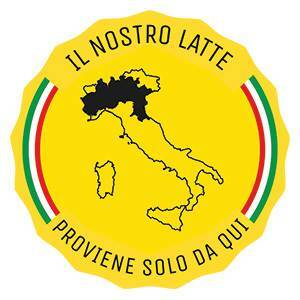 The “Il nostro latte” logo is composed of an image with a yellow background portraying Italy divided into regions, with two significant details: the statement "Il nostro latte proviene solo da qui" (Our milk only comes from here) refers to the geographical areas, highlighted in black, which represent the territories from which the milk used to produce Grana Padano is sourced. This logo can be used voluntarily by all consortium members and authorised packers, on all the Grana Padano packaging for both the Italian and foreign markets. The new “Il nostro latte” logo is governed by a regulation which establishes limits and conditions for granting the use of the logo, created and registered by the Grana Padano Protection Consortium, to packaging companies. Rules for "Il nostro latte"